The mission of the Fort Ord Reuse Authority (FORA) Board is “to prepare, adopt, finance, and implement a plan for the former Fort Ord, including land use, transportation systems, conservation of land and water, recreation, and business operations.” FORA began its efforts to create a Base Reuse Plan outlining how the site would be redefined for new uses. The Plan as formally adopted by the FORA Board in 1997. Numerous other studies have been completed as it relates to the former Fort Ord. The Authority was established through an Act of the California Legislature in 1993. FORA’s role is to implement a plan for the former Fort Ord. The FORA Board has released several studies related to the land uses on the site. FORA released its Final Scoping Report (32M PDF file) in October 2012. FORA released its Final Reassessment Report (2.9M PDF file) in December 2012. 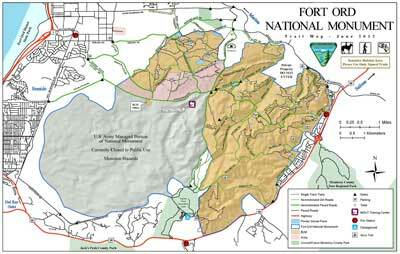 The FORA Board denied the County General Plan’s Fort Ord Master Plan in a tie vote (6-6) on March 14, 2014. The County now must make the Plan consistent, send it on for a vote to the Board of Supervisors and then back to the FORA Board. The project is located along the coast in the City of Monterey. At least three seats will be changing on the Fort Ord Reuse Authority (FORA) Board. All of this, just in time for the December 30th deadline to submit the FORA Transition Plan to the State. The Plan outlines the sunset of the organization including its assets and liabilities. FORA Forum this Thursday, December 1st, please attend! Applications Are Open For Fort Ord "Community Advisory Group"